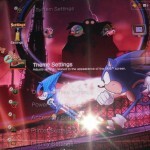 SEGA has released the PS3 version of Sonic Generations for download as part of yesterday’s EU PS Store update. Those of you who enjoy the convenience of on-demand gaming can now purchase and download Sonic’s 20th Anniversary title for £31.99/€39.99. The game weighs in at 8704MB and is available in all European locales. In other news, SSMB member Hogfather informs us that SEGA has also released a free Sonic CD PS3 XMB theme on the EU PS Store. The theme is based on the game’s Stardust Speedway race between Sonic and Metal Sonic and changes now and then from a bad future design to a good future design. Finally, Hogfather has also let us know that on December 4th, SEGA released the Casino Night Pinball DLC and two XMB themes for Sonic Generations on the Japanese PS Store. Hopefully they will be released to the rest of the world soon. The Japanese PS Blog also revealed a code for a statue of Sonic’s animal friends you can obtain in the game’s Statue Room. The code is: 249 651. Thanks to Hogfather at the SSMB for the heads up on the Sonic CD theme and the Sonic Generations DLC on Japan’s PS Store. Nice! I’m really liking the detail in those Dynamic Themes 🙂 or whaatever they’re called. I cannot wait for Sonic CD! 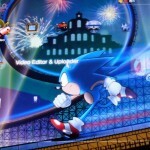 O_O Wait… is that a fanmade Sonic CD pic… is the contest over?! No. It’s new official art. Instead of moaning… why not just log in with an EU account and download it? Thats not the point…I think you missed it trying to look smart. At Jeb the Hedgefox I think that is new official art but the contest has been over for a while now. OH! My my… Well, does anybody know about the TSS Writer’s Position? Any news there? the code is already on gamefront there and has been since a few weeks ago before japan’s Sega blog said it. I posted it for those who are obtaining the codes legitimately. The code list posted a while back was obtained through hacking the game. I posted it for those who are collecting the codes through legitimate and official methods. The code list posted a while back was obtained through hacking the game. Even if us in the US could still obtain the theme through an EU account.. it really is starting to bug me that Europe and Japan seem to be getting pampered, with both small things like this and bigger scale things too. I didn’t mind at first but.. c’moooooon. So once they release the download version to everyone else, does that mean for those who own the disc versions get the benefits the download version (faster load times, better frame rate, etc.) via a patch?